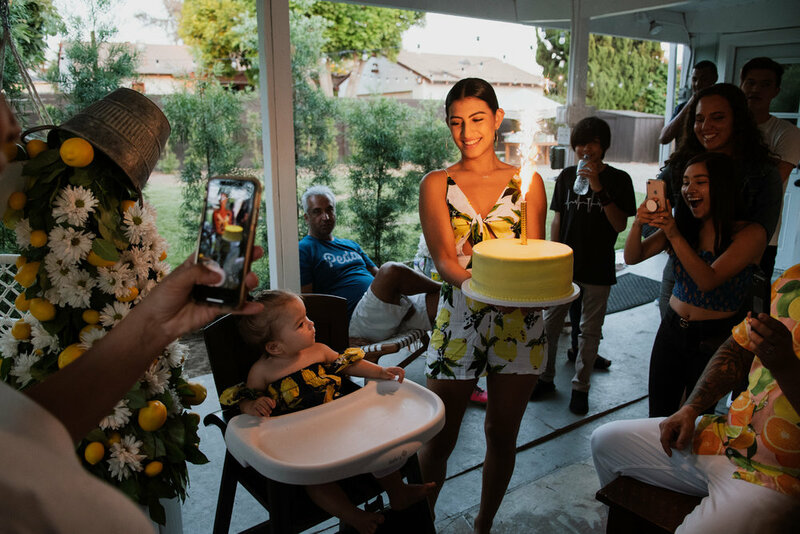 Reflecting on how many hours I work each week and always feeling challenged to maintain a good balance of business and family, we opted to celebrate Lucca’s first birthday at home, with mostly family and a few close friends. 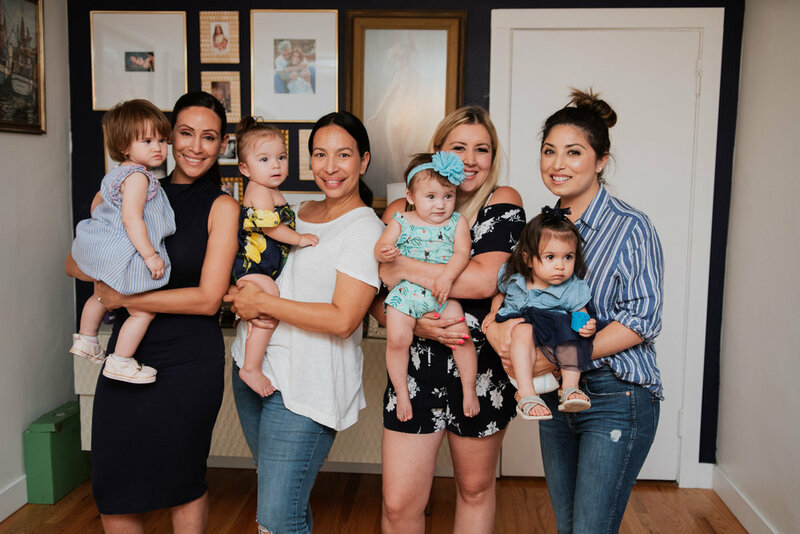 We knew Lucca would really enjoy a day with mom, dad, sisters, and relatives more than anything else. It was truly a success and I’m glad we decided to do it this way this year. 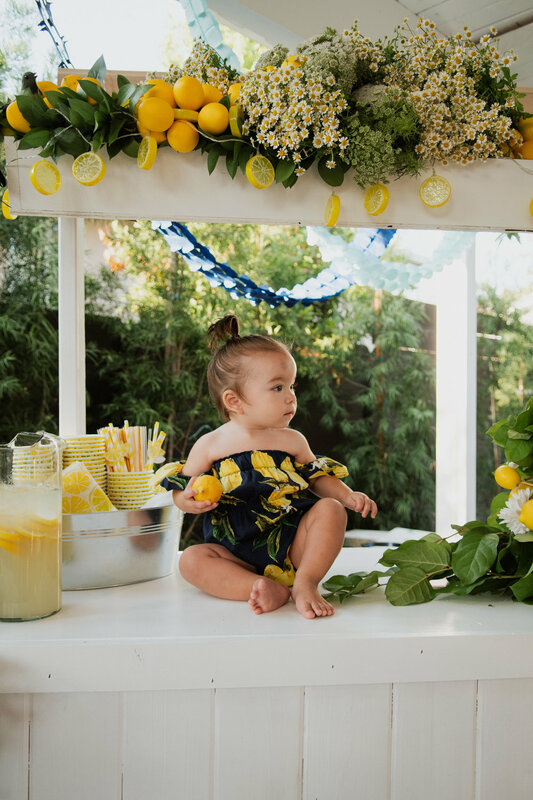 Lucca is sweet and has such a sunny disposition that happy shades of yellow and other citrus colors came to mind when I started to brainstorm on a theme. My husband, Herick. 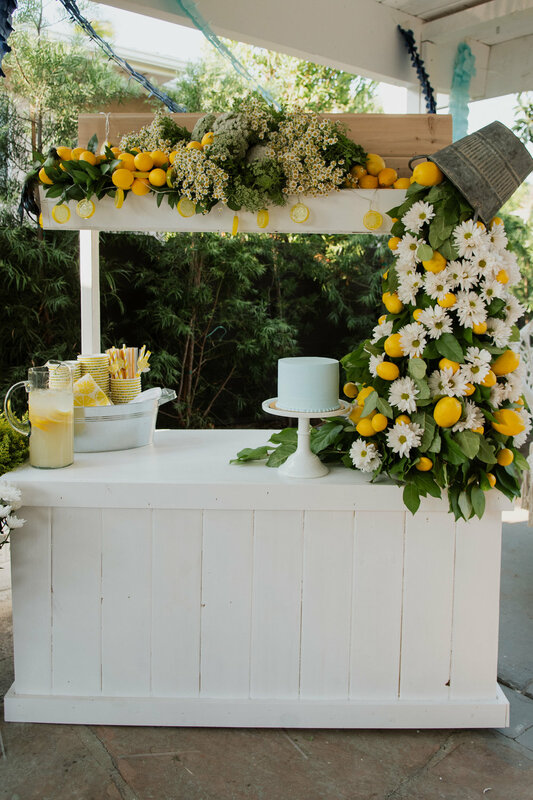 built our five-year-old daughter Francesca (“Frankie”) a sleek white lemonade stand especially for this so that she would feel included and play a special role at the party. Frankie was so excited to serve lemonade to everyone for most of the evening! The structure was decorated beautifully with the help of Ann at White Sakuras who really understood my vision and created such a striking arrangement – everyone loved it. 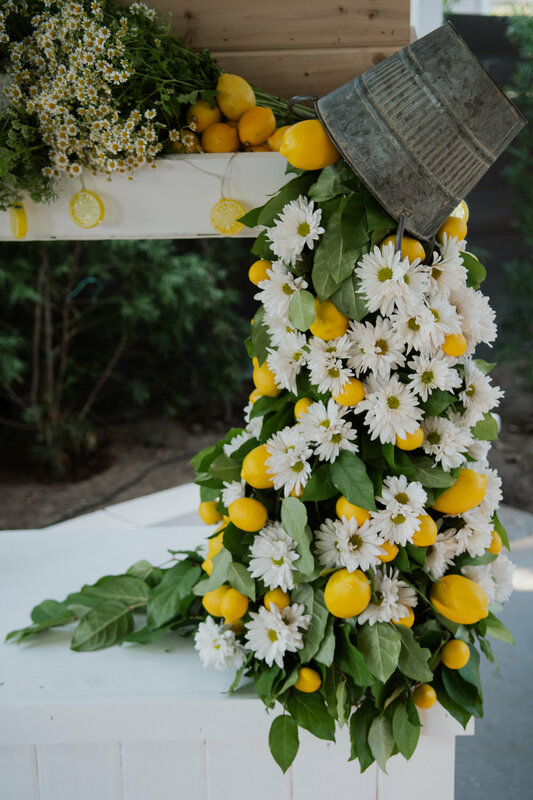 A garland, intertwined with lemons and lemon lights, draped over the top and “spilled” hundreds of daisies and real lemons off the edge of the stand. 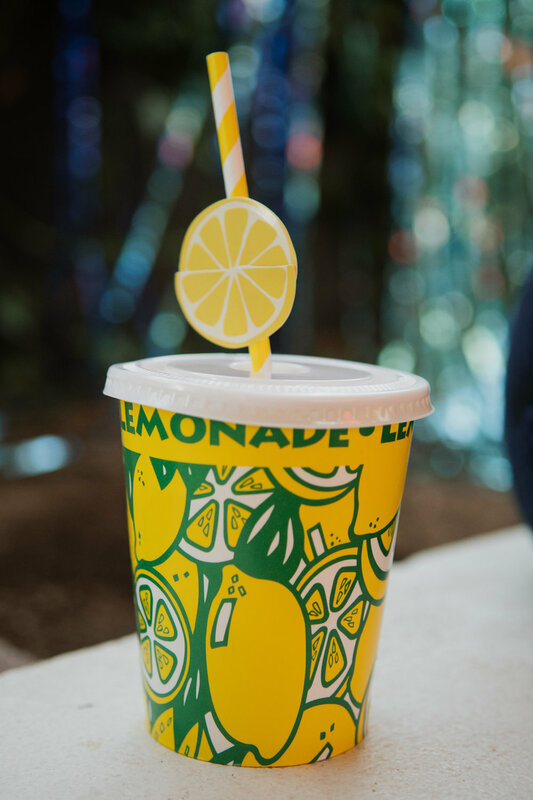 Lemon napkins and stripy yellow straws with paper lemon wedges were on hand for Frankie to hand out along with her iced fresh lemonade. 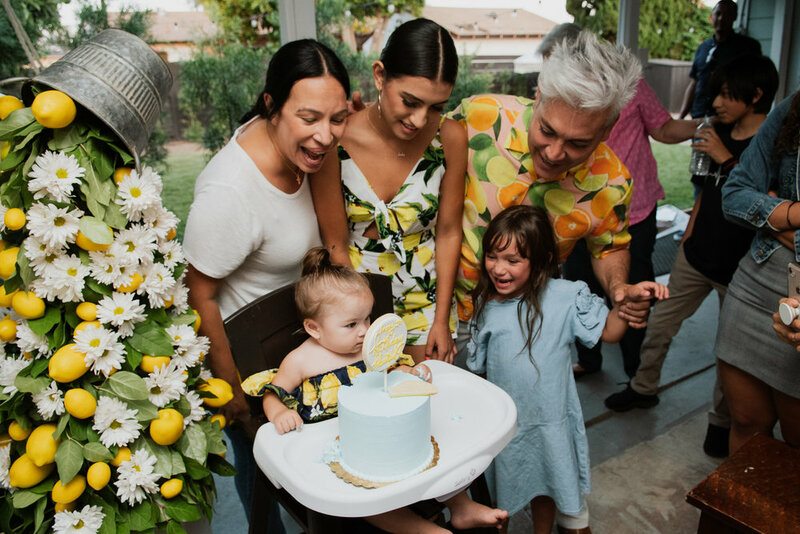 We had dinner catered – everyone served themselves with ease and ate and mingled casually on the back patio, using fun lemon-slice place mats wherever they chose to sit. 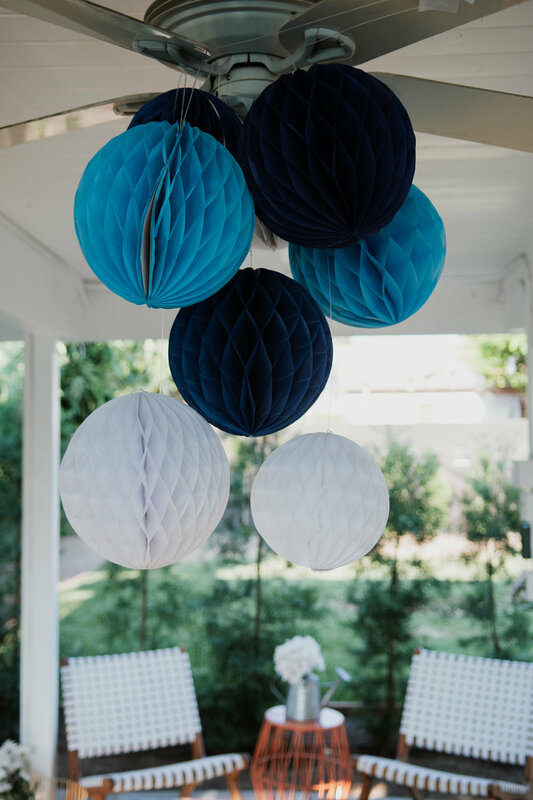 I thought the citrus tones needed a contrasting, complementing color so paper lanterns in shades of muted blue were suspended overhead and a single-tier cake mimicked the hue, as well as whimsical decorative garlands. 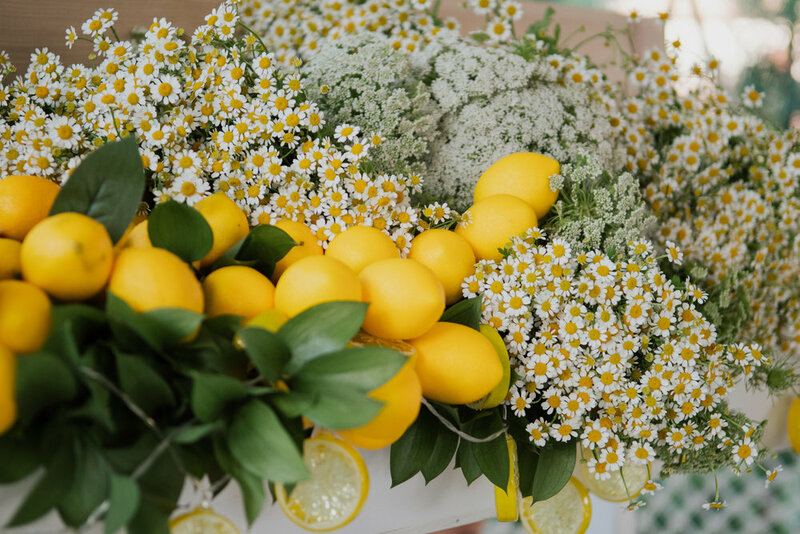 Dotted about the area were tins of additional floral arrangements, buckets of fresh lemons, and lush greenery. 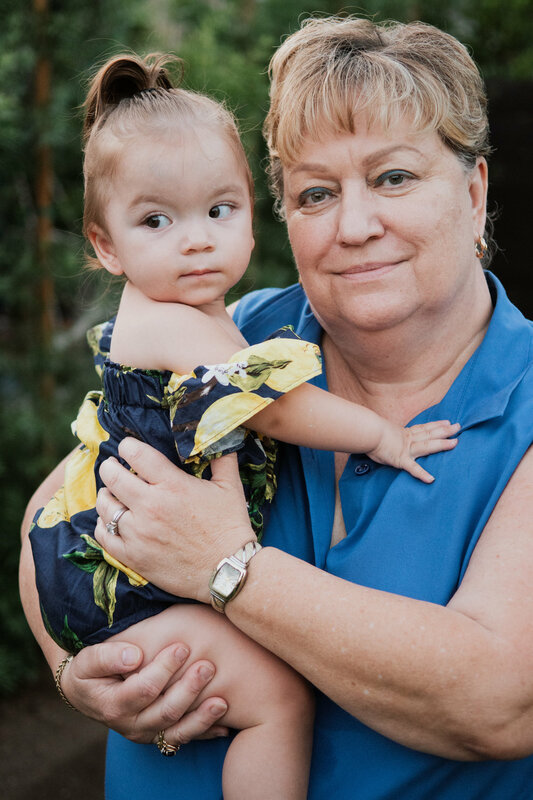 We love working with Auntie Apple! 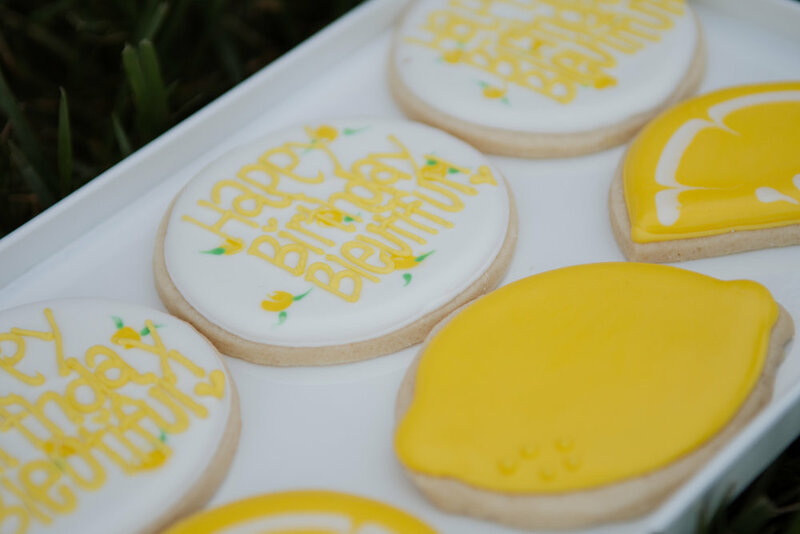 Jennifer baked sugar cookies crafted as lemon wedges, with some additional round versions decorated with the phrase,” Happy Birthday, Bleu-tiful” as a nod to Lucca’s middle name: Bleu. 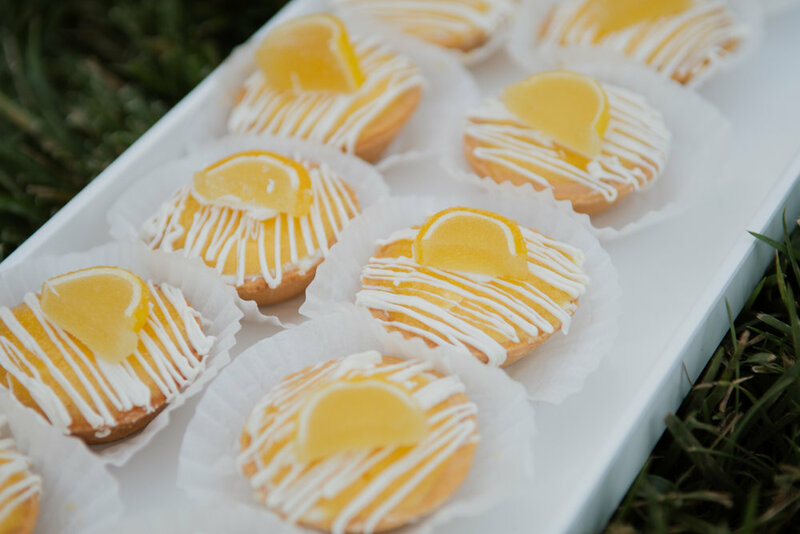 Scrumptious lemon tarts rounded out the desserts, while Lucca got to enjoy a yellow-frosted cake all to herself. She squealed in delight as big sister, Natalia, held the confection and the room sang “Happy Birthday” in unison. 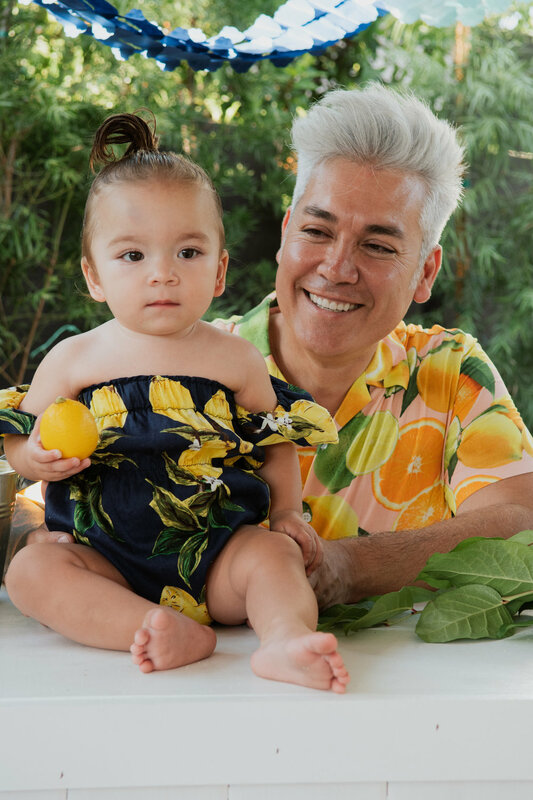 Lucca, with her hair up in a spunky ponytail, wore a cute black romper with a lemon print. 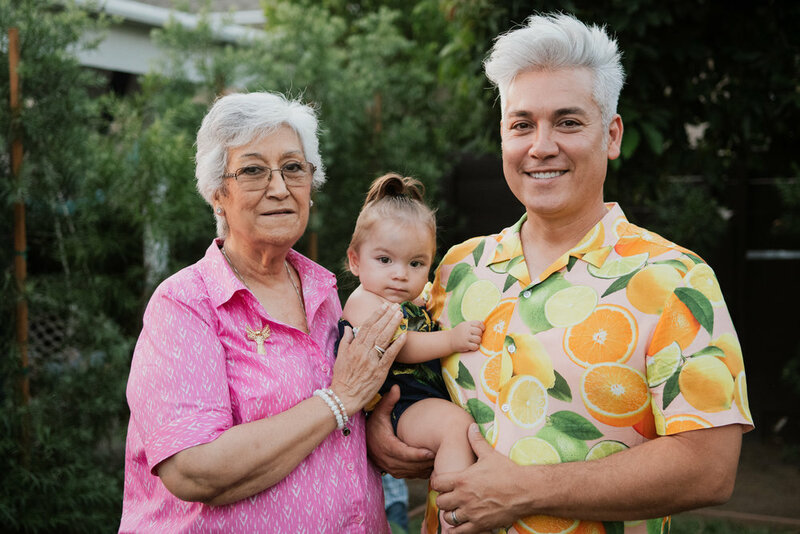 Our family loves a good theme, so we all dressed accordingly – are you loving Herick’s shirt? Orange you glad he wore it? 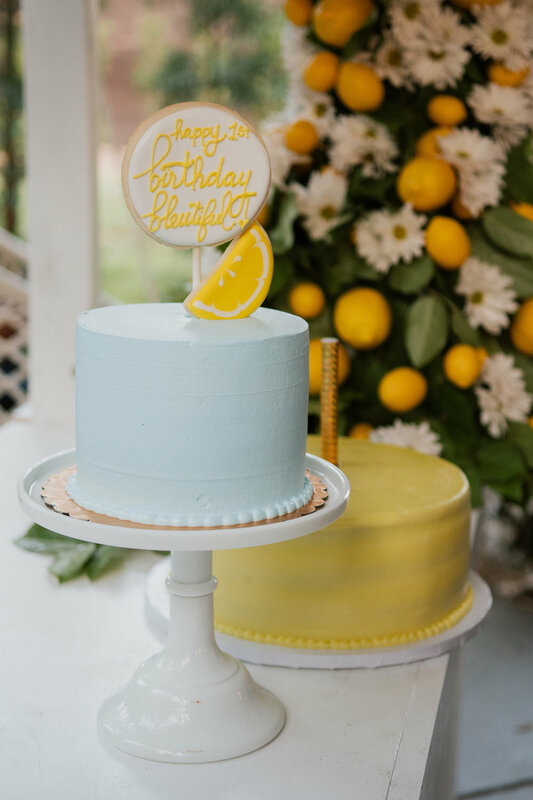 The ambience was perfect for a warm evening; it felt bright, sweet, cool and overall like a quintessential summery celebration. 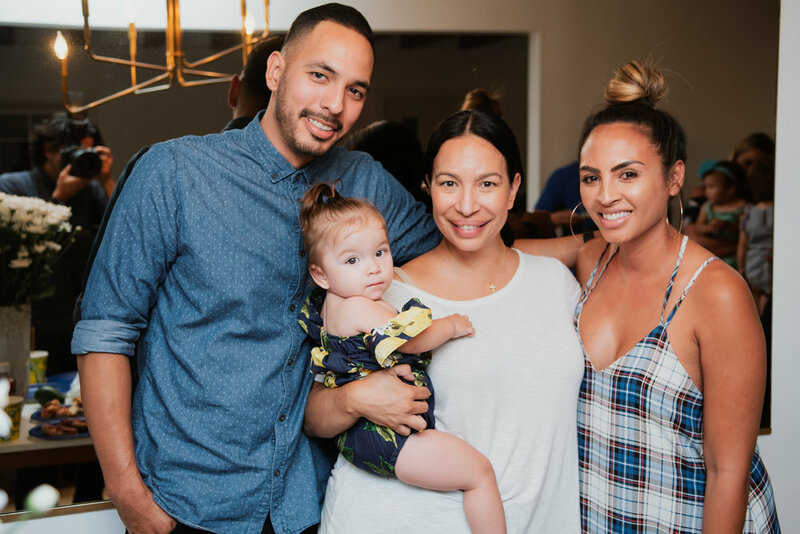 Since it was such a small group, guests were able to enjoy quality time with one another and feel engaged in the festivities. I admit that I was a bit apprehensive about not having a huge affair, but it all turned out better than expected. 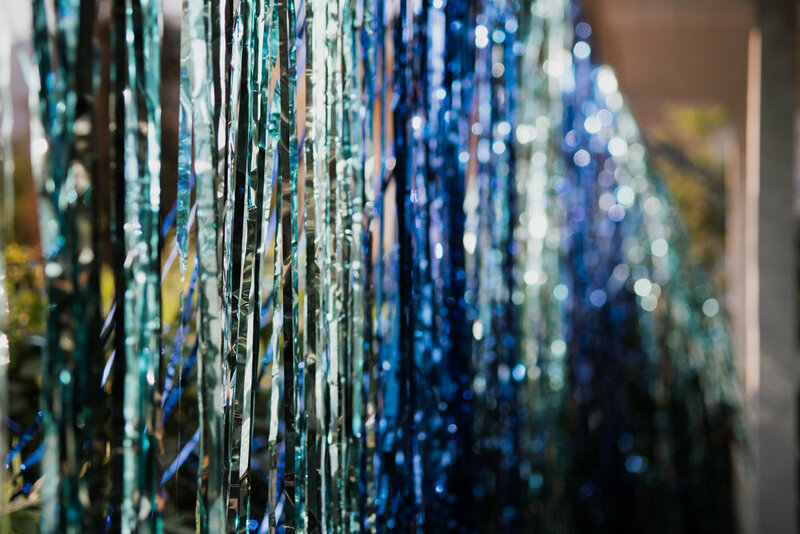 If you’re thinking that a smaller party might be a good idea for you, don’t feel like you need to forgo all the wonderful small details or stick to a strict color pattern! 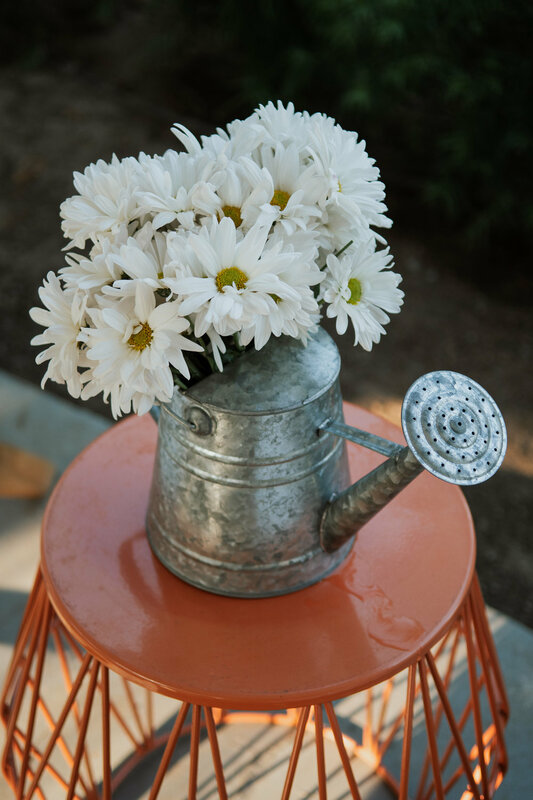 Be bold, do something unexpected, and plan for small-but-impactful elements that your loved ones will truly enjoy. That's HOT - Celebrating Paris Hilton!